Don't give me that look like "Oh, no, it's going to be a long, shaggy-dog story." Ye asked me about my fourteen-year-old granddaughter, Sharon, so what did ye expect? Besides, there are no short stories here at the Carnegie Deli. It takes forty-five minutes just to finish a sandwich here so ye may as well put up with my monologue, right? Sharon asks me, from time to time, if I've been to various places. I was the lead pilot in the Wolfpack for forty years, the entire middle of the twenty-first century, not the Wolfpack running group in Montréal nor the Wolfpack poker club in Cairo, but the Wolfpack pilots who fly people all over the world, especially people who don't want other people to know where in the world they're going. I've flown a lot of missions to a lot of places with a lot of interesting people. I flew to a lot of interesting places on this planet in my Wolfpack days, and my passengers paid handsomely for the privilege. I think I've been everywhere on this planet. Yes, I've been to the moon a few times, even was on the third commercial flight there in twenty-five, but I never flew there as the pilot in command. I can't believe that's more than a half century ago! George was some kind of manufacturer with factories in South Carolina and Uganda. I noticed our Wolfpack trips to Uganda carried crates of stuff in my trunk that didn't come back stateside. I knew there were weapons and equipment in there for various revolutionaries whom we both supported, he knew I knew, but we never said. I took Kate across more oceans than I can remember. She would have me fly her there or wherever, stay for five or ten hours, and then come back home to London. She had two suitcases that came with her and came home on her trips. I didn't ask what she did and she didn't offer to tell. There were lots of trips with Wolfpack customers and lots of solo-cargo trips just getting guns and ammunition to people who were fighting for their freedom. So Sharon asks if I've been to Rangoon and I tell her about it. She asks if I've been to Jakarta, sure I have, and I tell her. She asks if I've been to Vladavostok, yes, there too. "Grampa, have you really been all those places?" Yes, really I have. I taught Carol to fly about twenty-five years ago. She was fifteen and a truly able student. Like with all my students, I sat in my usual right seat and started her off following my lead, bank right, bank left, climb right, climb left, descend right, descend left, roll right, roll left, spin right, spin left, snap right, snap left, and so on. I was looking forward to getting her into the Wolfpack, getting her into helping the people I thought ought to be helped. She was that good in the air. Carol was also that good on the ground in her mathematics and computing classes. I remember the letter she got from the Martian Numerical Computing Institute. That's Martian as in Mars, the red planet in the sky at night, the red planet that's a hundred million miles away on average, the red planet that's going to take Carol far, far away from me. Because they found out I was influential in her life, they sent me a copy of her letter of introduction. That's what they call their acceptance letters, "letters of introduction," and their students aren't students enrolled, they're called "associates" who are "taking a position" at MNCI. They may be a bunch of snobs, but anybody who does what they do, the volume and quality of first-rate, useful work, has earned the right to be snobby. Remember Melody and Gus who wrote that incredibly fast distributed flight-simulator software? It looks so much more real than anything before and now I actually like flying the damned thing. They were MNCI graduates who came back to planet Earth. Clearly "taking a position" as an "associate" at MNCI meant no more flying, at least not on this planet. Earth's air is one thousand millibars at sea level and Mars has six millibars, about a hundred and sixty times less. Who's going to fly airplanes when there's hardly any air there? Still, this was the opportunity of a lifetime, maybe many lifetimes, that included, as their standard offer, transportation from Earth to Mars and one trip back to Earth, one way or return, the choice of the alumnus or alumna. That's no small perk considering what it costs to go between blue and red planets. Carol came to me in tears, "Oh, I can't go." I explained to her that she had to go. Losing her as a pilot might mean the end of everything in my world, but there are things worse than the end of everything. She had to go. I showed her the second page of my copy of the letter, the page they didn't send her. They're begging me to let her go, they want her in the worst way, they want her in the best way. She's seventeen and doesn't know from Shinola, I'm a lot older and I'm telling her, this is something she has to do. If it turns out wrong, she can come home and pick up where she left off. The little voice in my head asked why it couldn't have been Harvard or Cambridge making her a non-refusable offer. Harvard was good enough for me, class of two-thousand twenty-one, same as my wife. Cambridge was good enough for my Ph.D. But, no, not this time, not Boston, not Cambridge, not the other Cambridge either. This time, for Carol, it was Mars. Well, twenty-five years later I heard from Carol. Apparently, a group of freedom-loving radicals felt my history on Earth and my message would be heard on Mars. I told her I'm a pilot and an airplane-design manager who doesn't know anybody there who's going to be trying to send a political message on a planet without any air. My protests were lost and the budget to bring me there included passage for my wife Betty as well. So off we went. The trip wasn't that bad, even four weeks in a crowded space. If Ben Franklin could make it from Philadelphia to Paris and back every year, six weeks rocking seasickly in a wooden boat, I could endure a spaceship ride from Earth to Mars. I found out nobody calls it Mars, nor does anybody there call this planet Earth. From the time we lifted off to my return, there were "spaceside" and "sunside," there were "red" and "blue," sometimes just "here" and "there," but no "Mars" or "Earth." I don't want to think about how much the trip cost, never mind four weeks cooped up in that little room on the ship, but at least I had Betty with me and I got to spend a whole month to catch up with Carol on the way. When we got there, I made the appropriate speeches and sucked up to the people Carol wanted me to, but that's not my story here. Betty accomplished more of my mission than I did, but that's not my story here either. It turns out Carol didn't abandon her aviation roots. Somewhere along the way, ten years after she arrived on the red planet, about fifteen years ago, that's fifteen Earth years ago, she found the resources to build an airplane on this almost airless world. When she took me out to the hangar, us waddling in our spacesuits, the thing was huge, monstrous, too gigantic just to be enormous. My father always hated the word "ginormous," but it sure applied to this thing. It had a hundred times the wing area of a terrestrial light airplane, one hundred meter wingspan, and four, yes, ahem, ginormous propellers for thrust. After we moved this thing out of its hangar, Carol put me in my usual right seat, she climbed in the left seat, she started the engines, and she taxied out to a smooth area we used for a runway. Once we were airborne, she looked at me, did a right bank, straighted it out, and raised her hands to indicate that I was to copy her. Really? Does she expect me to do that? "Yes, Abe," she said, "really I do." So I did and she was right, it's a totally different feeling flying a ginormous airplane in the incredably-thin air of the red planet. She walked me through all the basic maneuvers as if I were a first-time student pilot, never mind how many tens of thousands of blue-planet hours I've flown. She let me fly and directed us out along one of the canals, which is what early astronomers called the Martian canyons. There was no compass because Mars has no magnetic field and no electronic navigation because the Earth globe of the Global Positioning System (GPS) was a long way away. There's no sea level on a planet with no oceans, so it had a pressure gauge from zero to seven millibars where an altimeter would be back home. We flew for about an hour and then I saw it, the largest mountain in the solar system, Olympus Mons. 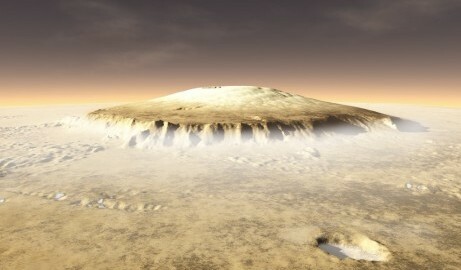 Understand, Olympus Mons is really, really big. Earth's highest mountain, Mount Everest, and Earth's biggest mountain from bottom to top, Mauna Loa, are pimples, just zits, compared to this Mount Olympus. She had me climb from five to two point five millibars. (Remember higher elevation is lower air pressure so a lower number is higher up.) It took another hour to get over the top of this, sorry Dad, ginormous mountain where she directed me to a level area. I asked if it was an airstrip. "No," she said, "just a level spot I check out from time to time." So I assume she had landed here several times before. Then she looked at me as if she were a teenager again and I were her primary flight instructor again. "I saved it for you," she said. Fifteen years of flying here, dozens of fly-overs, and never a landing? "No, and nobody else will land here until I do, so you'll be the first. I think it's right that you're the first to land up here." Carol waited fifteen years for me to come here when she had no reason to think I was ever going to come? "Yes, I did." So I lined up the airplane with the runway and descended to land. So Carol said she felt it wouldn't be right to land here before me. Okay, but I was really struggling flying this beast. Would it be right for her to give me a little advice and help? The thinnest air I've landed in is six hundred millibars and the thinnest air I've flown in is about sixty, and this isn't even three. She gave me advice about how high to keep the nose of the airplane and I was able to salvage a landing on this barren, red mountaintop. I was able to land on Mount Olympus. I noticed Carol had tears in her eyes as we set down. This was truly a life-dividing moment for her and I have to admit, never mind the technical difficulty for me of the actual landing, it was a true moment in my life landing atop Olympus Mons. As a sunside aviator used to blue skies, I certainly didn't expect to be doing any pink-sky flying spaceside, so this was an especially special treat for me. We went outside in our pressurized spacesuits. Playfully she pointed to a rock and said that's where Zeus and Hera live, king and queen of the ancient Greek gods. Another rock was where Hades lived, god of the underworld, god of death, the man I called "the man in black." When I grinned and asked about Poseidon, god of the oceans, where the nearest ocean was a hundred million miles away, Carol smiled back and said maybe we should wait for Apollo to come home up here driving his sun chariot. She said we would bring back an invisible passenger, Aphrodite, the goddess of love, and she would sleep with me tonight. I told Carol I would sleep with my wife Betty and she said, "Tonight, Betty and Aphrodite will be one and together they will rock your world." We took off again and flew back to the colony-city that we had left early that same morning and got back just around nightfall. Carol was right, by the way, maybe it was the lower gravity, maybe it was the spirit of the goddess, but Betty and I had a wonderful night that night. Yes, shut up, I'm getting to the point of my story. Sharon came to me last week and said they were studying the Greek gods of ancient times in her history class. She's already skeptical of my travel stories, doesn't really believe her grandfather went to Lima or Livingstone and I'm sure she thinks my pictures of Victoria Falls are really somebody else's. She's going to ask if I have ever been to Mount Olympus. 21:10:46 Mountain Standard Time (MST). 4653 visits to this web page.